The nominations were by peers, meaning people somehow connected with writing and/or publishing. The vote was open for the public. There has been, according to the organizers, a last-minute flurry of votes. Frankly, I was more than pleased to be nominated at all and even more so to be a finalist. I really never expected this. Below you’ll find the categories in which my books figure. 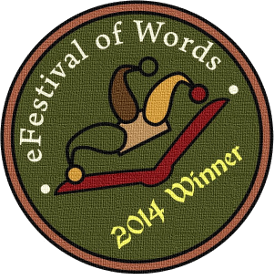 Here you can find all the winners of the 2014 eFestival of Words. I’m also pleased to see that my friend Caddy Rowland is the runner up in the Best Series category for her Gastien series, and colleague Mark E. Cooper in Best Fantasy for The God Decrees. My grateful thanks go to all the people who were kind enough to vote for my books, and to organizer Julie Dawson. You can vote here until August 27th. Congratulations Andrew, I am so glad your series won. I love it so much. Thanks, Michael. I’m glad you like the series. Congratulations on your winning awards and I love your books, you are such a talented writer. P.S. I am looking forward to the final book coming up, I read that you have finished the draft. Yes, the first draft is finished but there’s still a lot of cleaning up to do. I think it’ll be ready to be published the second half of October. To tide you over I will publish a few excerpts before that though. For the moment I’m busy with another project about which I’ll blog soon.